Looking for a tool to help you shed that negativity that runs rampant in your head? Tumbled black onyx reduces stress and helps you think more positively. The inside of the mind can be a real dark place, where thoughts whirl around like gremlins, haunting you 24/7. Our thoughts can cause us to lose precious sleep! 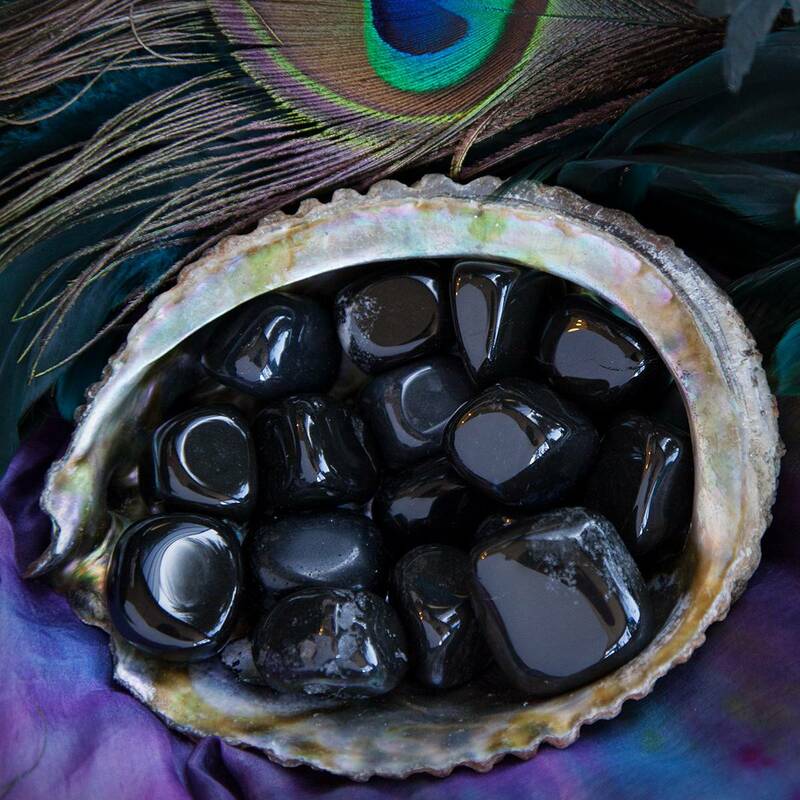 Black onyx purifies your thoughts and inner monologue, and can truly change your life. Because as we think, so we believe and behave. Black onyx is a stone of inner strength, persistence, willpower, and concentration. It keeps you focused, realigning perceptions, emotions, actions, thoughts, and more. Hold your tumbled black onyx in meditation. With every inhalation, imagine the stone sending its powerful energy into your Root Chakra to repair imbalances. Work with the stone every day and carry it with you in your medicine bag or pouch (even sleep with it beside you or under your pillow) for as long as you’re experiencing any negativity. Black onyx will soon banish these toxic thoughts from your energy field. Some bands are subtle while others are more defined. Each piece is unique and yet all black onyx does the same thing: Relieve stress. It purifies your thoughts and inner monologue, helping you to THINK more positively. And as we think, so we believe and behave. This stone can change your life. This listing is for (1) piece of tumbled black onyx, about .75-1″. which will come gift-bagged in organza with a white sage leaf that you can use to clear energies before using. You will also receive a card describing the properties and recommended use of each stone in case you are offering it to another who has not worked with this stone before. Just what I needed for a class! I ordered several of these for a body layout – they worked perfectly! Also – arrived fast and packaged wonderfully! Thank you! I have always been so sensitive to energy and vibrations. Once i recieved this stone i started feeling the purification in my thoughts. Dealing with metal illness it has been a real blessing! Thank you sage goddess! I did recieve a natural black onyx instead of a tumbled one tho…but i still love it! Maybe it was meant to be!! !